YIA Gallery is dedicated to celebrating children as artists, to illustrating the impact of arts education for all learners, and to inspiring and providing opportunities for art making. YIA Gallery is located at 917 C Street in downtown San Rafael. We are open to the public at no charge from 11-4, Monday through Friday, with occasional evening and weekend hours for announced special events. Group tours must be reserved in advance. We are open the second Friday of each month from 5 to 7 pm for 2nd Fridays Art Walk Downtown. YIA Gallery presents between 5-7 exhibits per year, most of which showcase the multi-disciplinary work of Youth in Arts’ students while also exploring the connection between Mentor Artists and the work of their students. 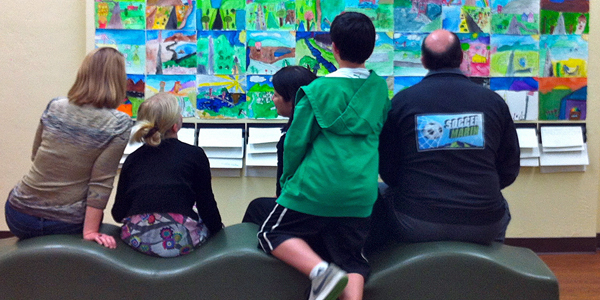 Each exhibit is complemented with hands-on art-making experiences that provoke inquiry and inspiration. You can find detailed listings for current and past YIA Gallery exhibits and other activities in the Events list on our website. Youth in Arts offers FREE tours for school and youth groups, Mondays through Fridays by appointment only. Each tour includes an exploration of our latest exhibit, plus a special hands-on art project. We try to introduce students to art materials they might not use in the classroom, and children get to observe, experience and create art in one visit. The program lasts approximately 45 minutes. We are only able to book one classroom at a time for this program (multiple classrooms will need to each schedule their own appointment). Call 415-457-4878 ext. 160 or email Morgan Schauffler morgan@youthinarts.org to book a free YIA Gallery tour for your class. Check out our current exhibit.